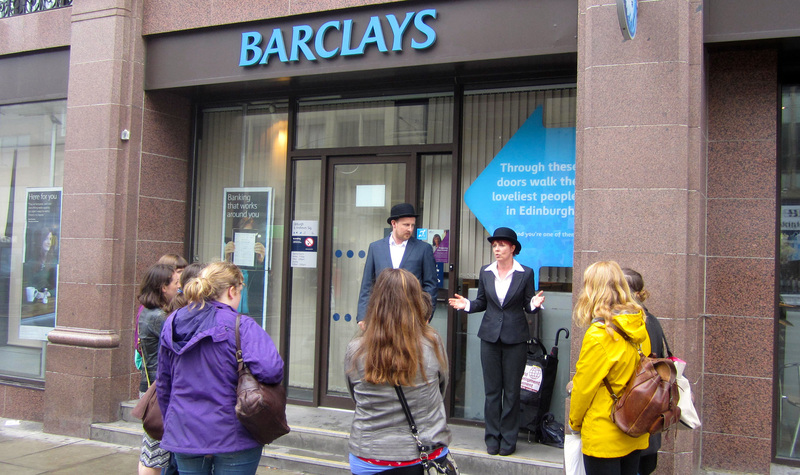 For our second Edinburgh Green Tease, we joined the Scandalous Edinburgh walking tour for a guided tour of Edinburgh’s financial district, with an abundance of harrowing stories of climate crime scenes linked to Edinburgh’s banks. The World Development Movement produces the Scandalous Edinburgh walking tour, and is an organisation with roots in London and Edinburgh that aims to bring economic justice to all. Our guides Rachel Amey and Pab Roberts provided intriguing anecdotes while taking our group through the UK’s second largest financial centre. Our tour started in the historic financial centre of Edinburgh, located around St Andrews Square. We heard stories of dirty energy investments by major banking institutions including Royal Bank of Scotland and Barclays, and even participated in spinning a web that was representative of the (currently) inseparable relationship between government, finance and non-renewable energy production. The second part of the tour moved onto the more modern financial district of Edinburgh, located on Lothian Road. Here we learned that corrupt investments are not a thing of the past, but are still happening today. Tar sands, Arctic oil investments and destructive coal mining in Colombia were just a few of the socially and environmentally devastating investments discussed on the tour. However, the tour wasn’t purely restricted to troubling stories of climate woes. We were taken past Triodos, an institution with a mission of making “money work for positive social, environmental and cultural change,” as well as the Green Investment Bank, an institution initiated by the UK government to offer investment capital to green development projects. The afternoon was certainly eye-opening to the positives and negatives of Edinburgh’s financial sector, and left us with a better understanding of how to take action against these dirty energy investments. More information about World Development Movement’s carbon capital project can be found here. Our next Edinburgh Green Tease will be announced shortly, be sure to check our News page, Facebook and Twitter for up-to-date information and our Instagram for more event photos. Feel free to post your own Green Tease reflections using #GreenTease.